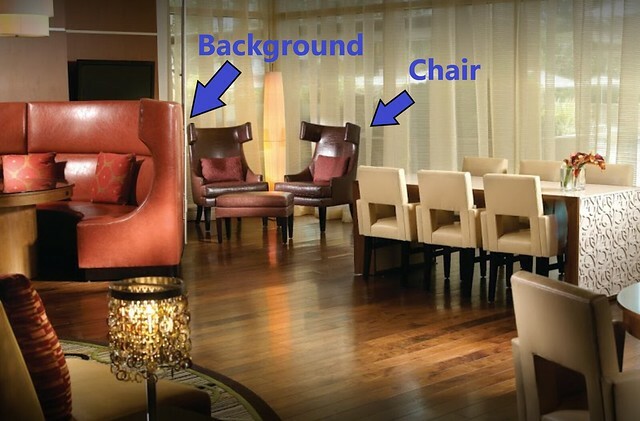 Here is the location we were using, in the lobby/restaurant area of the Marriott. Vivien mentioned that she wanted some photos of herself seated. I wasn’t sure that I had a location that really worked with that, but then I remembered that I had done a lighting test a couple days earlier using an armchair that was against some windows. So we went over there, and discovered that one of the two chairs was free. (The other one was occupied by a woman taking a nap with a child on her lap. They didn’t appear to mind us using the other chair, and I think we managed not to disturb them. I figured it was, after all, a hotel lobby, so it’s not as if she could have expected total quiet for their nap.) I took the free chair and turned it around to face the window, pushing it up against the curved back of a leather restaurant booth. Turning towards the window gave good light. The sun wasn’t coming directly through the window, but rather was spreading nice, diffuse light through some sheer curtains. I had to be careful to line up everything, as I didn’t want the TV screen on the wall or the other hotel lights to show in the shot. In order to get all of the chair and Vivien in the photo, I had to get back a lot, since I was using a 35mm prime lens (which converts to about 50mm with the crop factor of the Nikon D7500). I could have switched to my wider-angle lens, but I wanted to avoid the distortion I would get with a shorter focal length. So I ended up sitting on the footstool that went with the armchair Vivien was seated on, pushing the stool up against the window. I had my back right up on that window. It was important that I got down to the same level as Vivien to take the photo, because otherwise, I would have had a downward angle that would have made her look oddly short. In terms of posing Vivien, I put her torso and legs at an angle relative to me. If instead she had sat with her knees and legs pointing straight at me, we would have gotten some foreshortening, which would have made her legs look out of proportion with her body. I also tried to spread her cape out to frame her body and moved her left arm forward so that the First Order patch on her sleeve would show. Here is the raw photo, only with a lens profile correction applied. My settings were f/4.0, 1/60th of a second shutter speed, and 900 ISO. Obviously there are a number of distracting things in the background that needed to be addressed. Most of the stuff in the top half of the photo could be cropped out, thankfully. If I had to do it again, I would try to get the tip of her shoe in frame. I did get a shot that has it in, but I liked everything else about this take better. 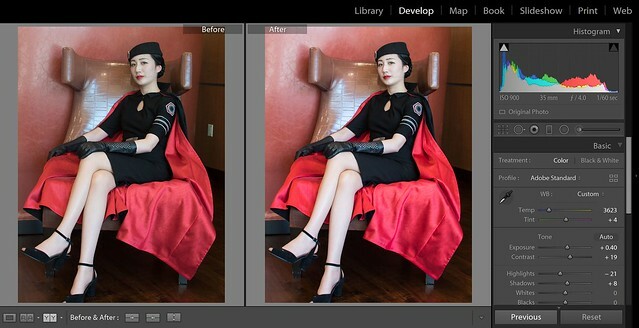 After cropping, I did some exposure and color adjustments in Adobe Lightroom. I was also able to remove the outlet on the wall. I went back and forth on whether I should also remove the black line in between the wood paneling. I decided it was dark enough not to be distracting. And here, again, is the final shot. It’s interesting to see the breakdown and hear about your process! I enjoyed shooting with you! Thanks Vivien! It was a pleasure to work with you!